Pimpama Dental Centre > Blog > Dental > What Makes Wisdom Teeth Harder to Remove? Wisdom teeth are a set of third molar that rarely grow into position correctly. Complications are commonplace with wisdom teeth. Symptoms include failure to fully erupt through the gum, the teeth becoming impacted or causing other teeth the shift out of alignment. Wisdom teeth can also grow on abnormal angles which can affect our other teeth. 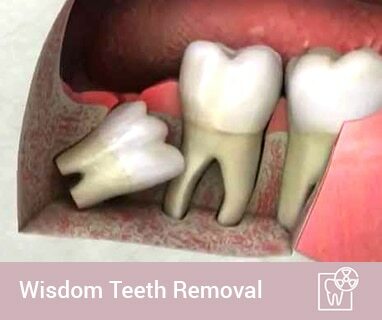 To avoid persistent pain, the possibility of infections and teeth alignment issues your dentist may recommend you to have wisdom teeth removals. Your dentist will take a full mouth x-ray (OPG) to see the position of all four wisdom teeth. The OPG not only shows how the teeth are forming and positioning but it also shows the dentist how the teeth are sitting in relation to the mandibular nerve that runs along the lower jaw. Not everyone will require surgical removal of wisdom teeth but in some cases having all four teeth removed by an oral surgeon, under general anesthetic is a good option. The angle of the tooth- some wisdom teeth grow perfectly into their position in the mouth, others grow on abnormal angles that do not allow them to position correctly in the mouth. If the tooth is fully erupted or still partially covered by gum and jawbone. When the wisdom tooth is still covered by a flap of gum it can cause a food trap that is difficulty to keep clean. This can lead to infection around the wisdom tooth. Multiple roots and unfavourable angles- the more roots the tooth has the more difficult the removal process can be. Sometimes the roots can break during the extraction procedure and the dentist may need to remove some bone to remove the tooth without any breakage. The jawbone being very dense- this usually means the wisdom teeth are being held in very well and can be stubborn to remove. The position of the roots in relation to the mandibular nerve- in some cases the roots of the wisdom teeth can grow around the nerve, making extract particularly dangerous in regards to nerve damage. When trauma occurs to the surrounding nerve, feeling in the lips, tongue and cheek can be lost either temporarily or permanently. Here at Pimpama City Dental Centre are dentist are highly trained in the removal of wisdom teeth and will endeavour to make the procedure as relaxed for you as it possibly can be. If you are having issues with your wisdom teeth don’t put it off any longer, call our friendly team today to make an appointment.